4" x 2" Thermal transfer polyester label. 1 label across. 2,950 labels/roll, 4 roll case. 1" x 0.5" Thermal transfer polyester label. 1 label across. 9,420 labels/roll, 4 roll case. 1.5" x 1" Thermal transfer polyester label. 1 label across. 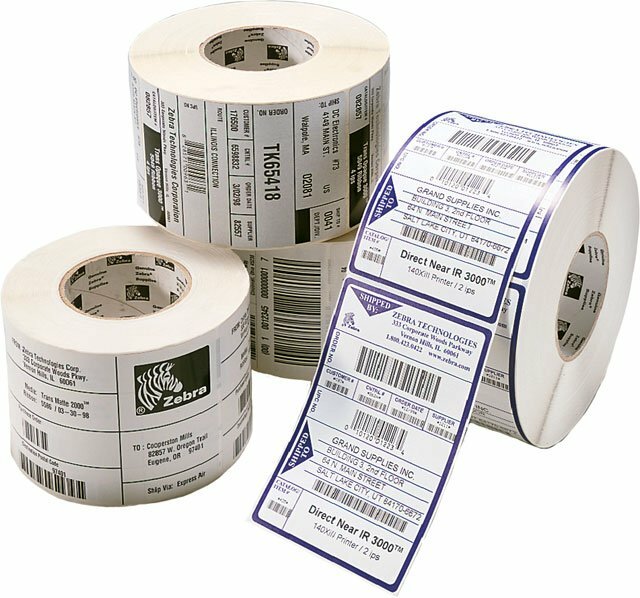 5,486 labels/roll, 4 roll case. 3" x 2" Thermal transfer polyester label. 1 label across. 2,950 labels/roll, 4 roll case. 1.5" x 0.5" Thermal transfer polyester label. 1 label across. 9,420 labels/roll. 4 roll case. 4" x 2.5" Thermal transfer polyester label. 1 label across. 2,240 labels/roll, 4 roll case. 1" x 0.5" Thermal transfer polyester label. Single roll. 2" x 0.25" Thermal transfer polyester label. Single roll. 3" x 0.25" Thermal transfer polyester label. Single roll. 2.5" x 0.2" Thermal transfer polyester label. Single roll. 2" x 0.4" Thermal transfer polyester label. Single roll. Purchased for its unparalleled smear resistance. Unfortunately, my Toshiba TEC B-SX5 printer was not able to achieve a good transfer, and so I am not able to use the labels. I even ordered the recommended Zebra 5095 high Performance resin ribbon.